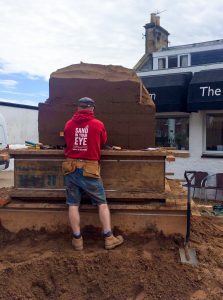 Sand in Your Eye have made a huge 20 tonne sand sculpture in the little and very beautiful fishing village of Crail for the past 7 years, so we were very pleased to be invited back for the 8th time. It feels a bit like visiting family, we recognize lots of local faces and always receive a warm welcome. Day one is compaction day. 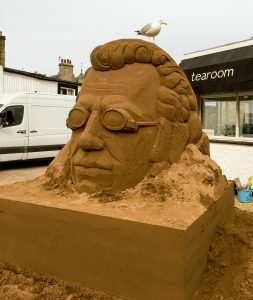 As I was busy on another event, I missed out on shoveling 20 tonnes of sand! Instead Jamie was joined by Sand In Your Eye Scotland (Tilly, Georgina and Sam) together they worked well into the evening to complete a huge compaction, but finally it was finished. I joined Jamie for the sand sculpting days, we knew that the weather would not be on our side this year, but we didn’t let it beat us. 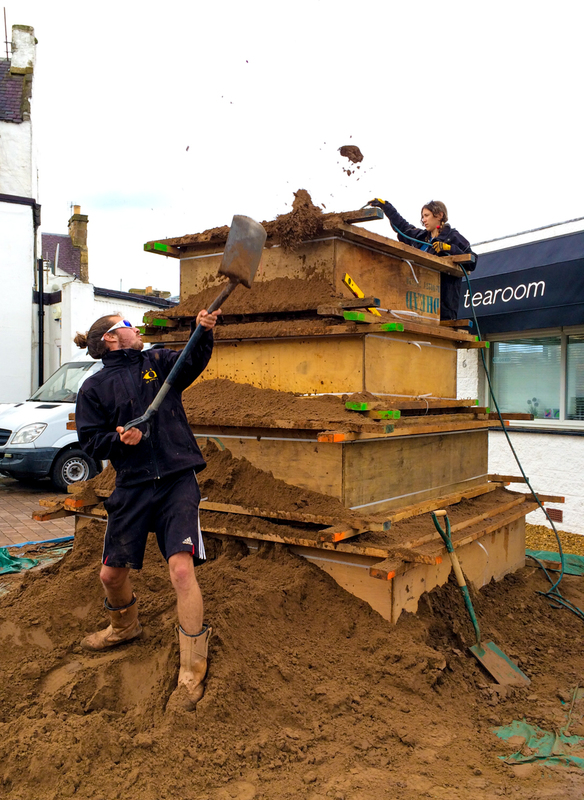 As no rain was forecast for Monday, we worked all of the hours of daylight to get as much completed as possible before the heavy rain came the next day. 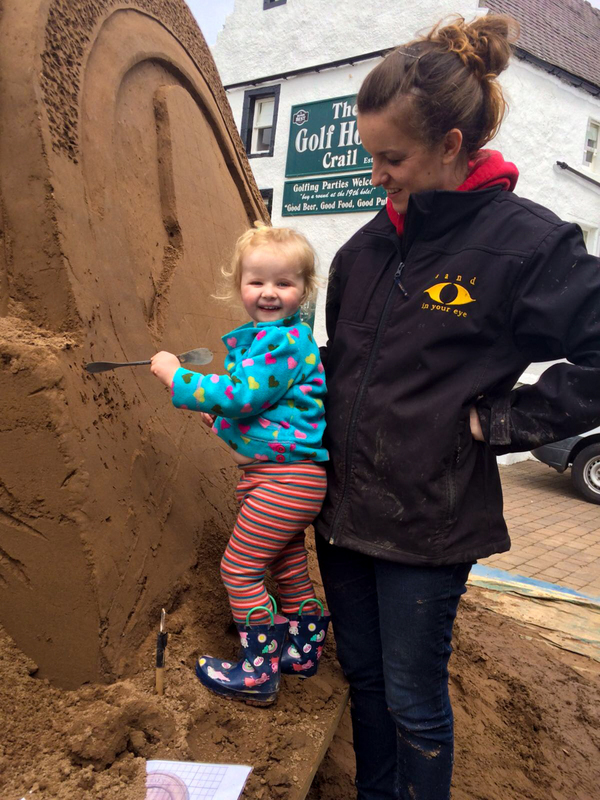 As predicted day 2 was a complete wash out, but we knew we would get a 1 day reprieve on day 3. 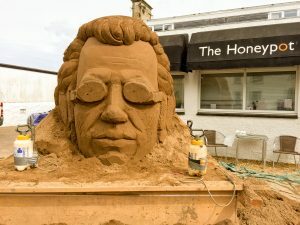 We carved sand like there was no tomorrow and managed to get the top half of the sculpture completed. 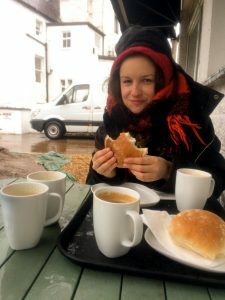 But we knew the rain was back again for the following day and this time worse than the day before. 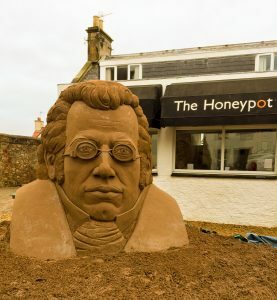 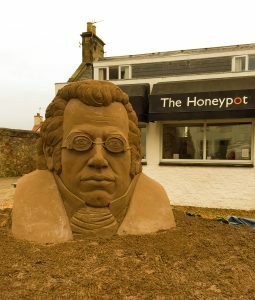 As we were sculpting well into the evening, Graham who owns the Honeypot Café in Crail with Edna, came up with an idea. 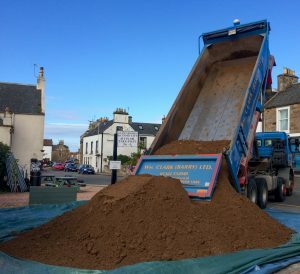 Graham saved the day. 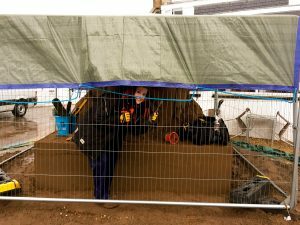 We made the security fences into makeshift walls and a tarp on top, made a wind and rainproof cover, which not only protected the sculpture from the torrential rain, but also meant we could carry on sand sculpting through it too! 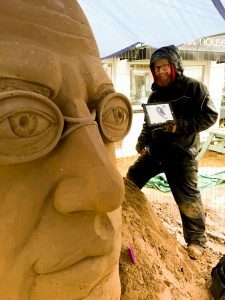 We spent the next day under the tarp shelter, caged in by the fences and got the sculpture finished! 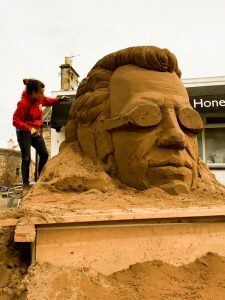 Big boss checking on Jamie’s progress. 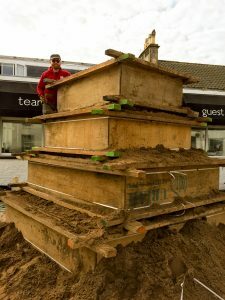 The Friday was the grand unveiling and the press call. 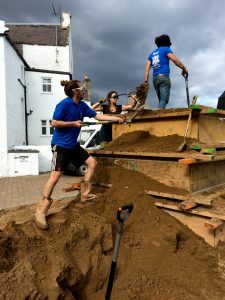 We arrived early to remove the tarp and fences to reveal a unharmed sand sculpture surrounded by a sandy mud bath of the exposed loose sand. 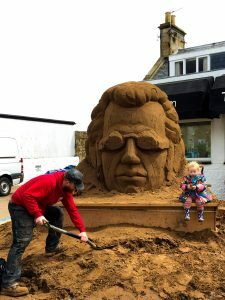 Everything was ok! 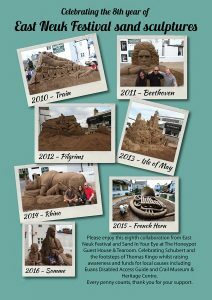 We are happy to say the sculpture made many of the local and national newspapers and we are really proud of the results. 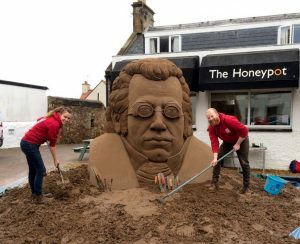 Franz Schubert at the front and a cameo of Thomas Kingo at the back. 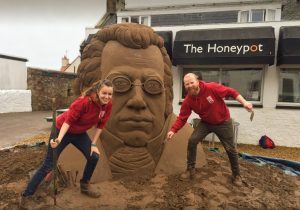 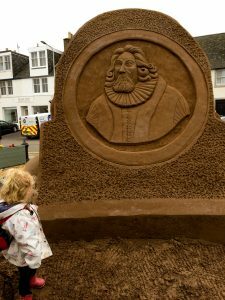 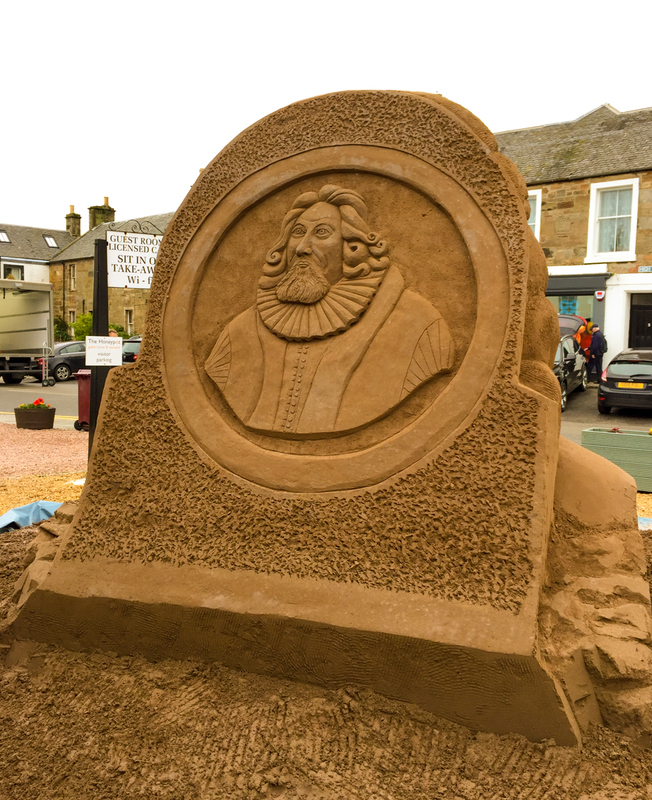 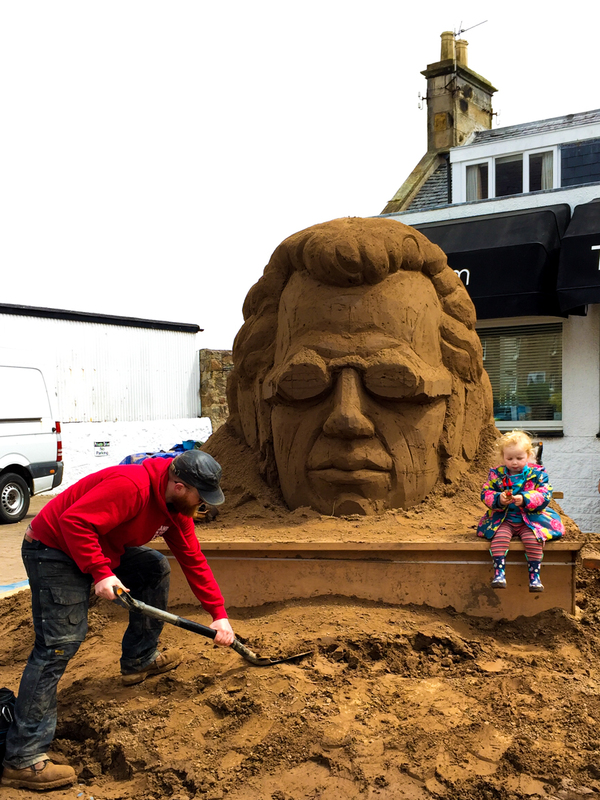 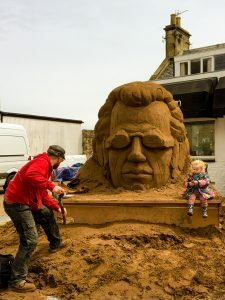 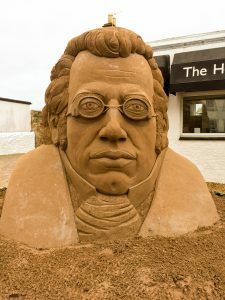 A sand sculpture of Thomas Kingo a composer from Crail. 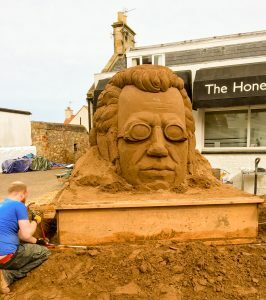 Past sand sculptures East Neuk Festival and Sand In Your Eye. 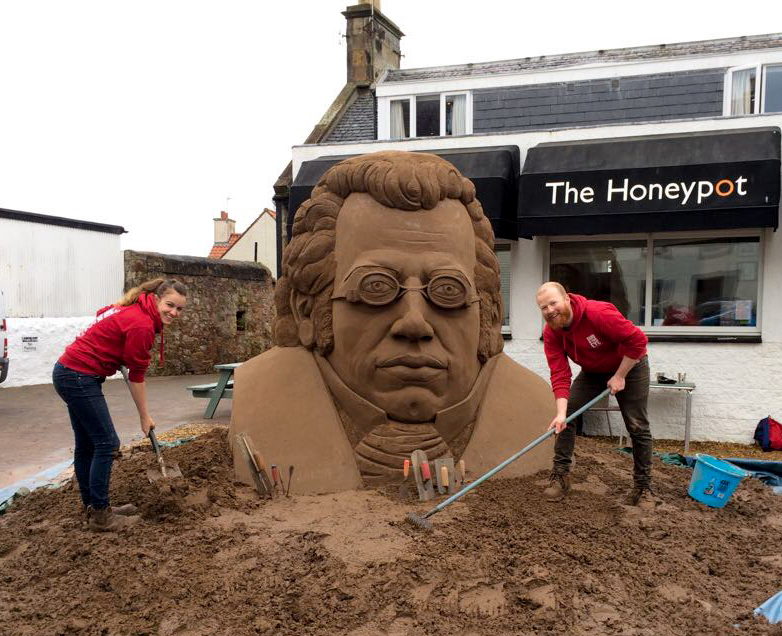 The sand sculpture is slowly emerging from the sand.